Righteous Pups Australia (RPA), formerly known as Righteous Pups Bendigo, is a not for profit organisation, which became an Incorporated Association in Victoria, on 4 July 2005. Our Association is endorsed by the Australian Taxation Office as a Tax Concession Charity with Deductible Gift Recipients Status. RPA was established in 2003 with its mission to raise and train assistance dogs to do a variety of practical tasks for children and adults with mobility issues, and to act as companion dogs for the elderly and socially isolated. The impact each dog makes on the life of their recipient is priceless, giving recipients a greater level of independence, self-esteem and an overall improvement in psychological well-being and quality of life. Each dog costs approximately $29,000 to rear and train over a two year period. At the completion of this time the dogs are placed with their recipients at no cost. Another vital part of our vision is to work with at risk teens deemed to be at significant psychological and/or educational risk. Our S.W.A.T (Specifically Working with At-risk Teens) and our BTGS (Bridging the Gaps) programs invite secondary college aged students, selected by their school welfare co-ordinator, to join us by giving up a day of their normal school curriculum to help us train and care for our assistance and therapy dogs. Working with animals has proven to have a major positive impact on teenagers, especially those with anger, anxiety and depression related issues. These trainees are now competent dog trainers who absolutely love working with the dogs and many have returned to successfully complete their secondary education with renewed vigour and belief in themselves for a positive future. We believe there is a tremendous sense of personal pride, significance and community spirit when you are involved in something greater than yourself and we have seen young people’s lives changed and transformed. In 2005 we were approached by a family in Bendigo, who had an 8 year old daughter with autism. Her parents wanted to obtain a trained assistance dog capable of supporting the family by becoming a meaningful companion and assistant for their daughter. This request was outside the area of our existing expertise, and as such, we conducted a search to identify an organisation within Australia that currently provided this service. Surprisingly, we could not find one Australian organisation proficient in the training and placement of assistance dogs for children with autism. We extended our search internationally and discovered a United States based organisation known as 4 Paws for Ability, who were the first in the US to train and place assistance dogs for children with Autism and whom have partnered with other organisations throughout the world to train and place assistance dogs with children living with Autism Spectrum Disorders. In 2006 we sent our first trainer to the US to learn how to train and place assistance dogs for children with ASD. Kelly Stevens completed her cadetship in mid-2007 and returned to Australia to see the first litter of 10 Kadnook Labradors begin their training as Autism Assistance dogs for children with ASD. 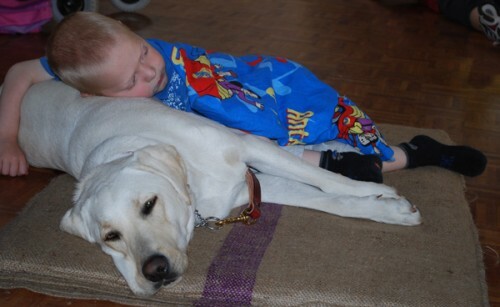 Fittingly, the family from Bendigo who sparked this fire were the first to receive an Autism Assistance Dog trained in Australia. 2006 was also the year we moved into a disused wing of Bethlehem Home for the Aged. We were able to use this great space and in return we ran a bi-weekly therapy dog program into the nursing home, which was a big hit with the residents and our young people who were able to meet a hear the stories of a great generation. By far, 2011 was both the most stressful and extraordinary year in our history. We were operating out of Bethlehem Home for the Aged, through the generosity of Mercy Health. It was a lovely facility and we were so grateful for Mercy Health’s support, but the site was going through a redevelopment and as a result the building we were operating out of was going to be demolished. We were a young ‘not for profit’ charity just beginning to gather momentum and staying one step ahead of the bills… let alone afford to be able to rent a substitute space for our operations. I remember we were just going for our accreditation with Assistance Dogs International and things were getting really tough and there was a couple of times I worried we might be forced to shut down. Then, one Saturday we were all working on our accreditation when I got a phone call from an extraordinary lady who had heard about our plight and wanted to do something to help. I remember her saying to me ‘I’d like to donate 150,000 dollars to help you guys find a place’. If it wasn’t for that miracle, we wouldn’t be here in Lockwood on ten acres. Our property at Lockwood was an answer to many prayers but we needed to do a lot of work to get the property ship shape for all the dogs and young people. We needed to comply with council rules and regulations and also meet industry standards. We had profound support from our community and together the new site became ready for our operations and we would like to warmly thank Paul and Anne Archer, Geoworx Pty Ltd, Chris Dellar Plumbing, , Jai Baker Earthworks, Shelton Fencing, BlueScope Steel Bendigo, Boral Concreting, Leader Electrical, Ross, Michael, Richard, Nat, Luke, Dave B, Len, Lou and everyone who worked tirelessly to transform the site. On the 21 December 2011 we officially moved into our Lockwood property. The 15th Transport Troop, from the Australian Defence Force played a major part in the move by providing reinforcements and trucks to move all our fencing, agility equipment, kennels, training apparatus, and everything else you can imagine including the kitchen sink. The 15th Transport Troop are an extraordinary bunch of soldiers who are not only proud to serve our country but also local communities and we felt very honoured and humbled by their willingness to help us with such a massive task! In 2015, the eight year old daughter of one of our trainers was rushed to hospital gravely ill and tests soon revealed her pancreas was no longer working correctly and her body was toxically high with sugar in the blood. Her muscles were breaking down, her vision disappearing and her mum and dad distraught as they watched their once vibrant and active child, wasting away. This little girl dropped to 25 kilos while doctors tried to stabilise her. This brave little girl was diagnosed with Type-1 Diabetes which would now mean a life of constant blood sugar readings, controlled eating and multiple injections of insulin. In honour of this pint size hero we have forged a relationship with the world’s oldest and best Type 1- Diabetes medical alert dog program, Dogs4Diabetics in the USA. This amazingly open and generous organisation has invested hundreds of hours of time into training and mentoring both our two and four-legged teams. D4D will continue in friendship and as our mentors to ensure we are able to provide a world class type-1 Diabetes medical alert dog program for Australians and their families.